With the World Team Trophy in Tokyo this weekend and Yuzuru Hanyu and his Winnie The Pooh plush toys in full force, I couldn't think of a more fitting time to share a look back at an early history of figure skating in Japan. Although evidence exists from 1804 of explorer and cartographer Kondo Morishige publishing a depiction of a reindeer pulling an Ainu man on primitive skates, Japan's humble beginnings in actual figure skating seem to trace back to Manchuria, which was a volatile area in northeast China and Inner Mongolia in the 1930's and 1940's. In September of 1931, Japan's Kwantung Army invaded the area and established a puppet state called Manchukuo. Their occupation lasted until the end of World War II, and it could very well be during this era that Japanese skating blossomed. The Manchukuo National Physical Education Association was established in 1932 to promote sport and in his book "A Companion To Japanese History", William M. Tsutsui writes that "Kobayashi Hideo hints at the role of Manchuria, for example, in popularizing ice skating in Japan and nurturing some of the nation's early international competitors." That's not to say people weren't skating in Japan before the Manchu people helped popularize and support the sport. The Japan Skating Federation was formed in 1929 to serve as a governing body for both figure and speed skating. In Maribel Vinson-Owen's 1938 "Primer Of Figure Skating Book", making a case for written instruction in figure skating, then-USFSA President and former U.S. Ice Dance Champion Joseph Savage wrote "that figure skaters can learn in this manner was ably demonstrated by the Japanese 1932 Olympic Figure Skating team who had to learn skating from the written word" suggesting Japanese skaters of the era received written instruction on elite level skating during the era. The first All-Japan Figure Skating Championships were held during the 1929/1930 season in Nikkō, a city one hundred and forty kilometers north of Tokyo. The first Japanese figure skating champion was Makoto Kubo and five years later, Japan would hold its first ladies competition which was won by a very young skater named Etsuko Inada. 1932 was the first year Japan sent skaters to the Winter Olympics or World Championships and Kazuyoshi Oimatsu and Ryoichi Obitani finished ninth and twelth in the 1932 Winter Olympics and seventh and eighth out of nine in their first effort at the World Championships. Inada would be the first female Japanese skater to compete internationally in 1936 when she competed at the EUROPEAN Championships, Olympic Games and World Championships and placed in the top ten at all three. At twelve, she was the youngest and smallest of all of the competitors at the 1936 Winter Games in Germany and was quite popular among the other athletes. The next Olympics were scheduled to be held in Sapporo, Japan and were cancelled due to World War II, but that or even World War II didn't end the skater's journey on the ice. As Japan and Germany were not invited to participate in the 1948 Winter Olympics in Switzerland, yet another precious chance for Olympic glory passed Inada by. She returned to competition in her late twenties in 1951 after many years away and reclaimed her national title in 1951 right before the 1952 Oslo Games but ultimately didn't make it to Oslo to compete. Inada turned to coaching students at the Jingu skating rink in front of the Prince Chichibu Memorial Sports Museum and coached several Japanese Champions including Junko Ueno and Miwa Fukuhara. Later in life, Inada opened a fashion boutique in Tokyo and she passed away of stomach cancer in 2003 in Chiba. In the early fifties, an American man named Jack B. Johnston won the Japanese men's title. Nami Yasufuku at the Nagoya University Library found a March 12, 1953 article in the Asahi shinbun newspaper stated that Johnston "had won the U.S. Championship of pair skating. He was affiliated with Kyoto skating club at 1952/1953. Other players came short of the pass mark to compete the championship and only he got score over 4.0. He was the first foreigner to win the Japan Figure Skating Championships." Interestingly, according to Karen Cover (U.S. Figure Skating's historian) there are no records of Johnston ever winning a U.S. pairs title on any level so one has to wonder who Johnston was or what background he had before claiming the Japanese title that year. Miho at the Japan Foundation in London also wasn't able to find anymore information about this mystery man. Although his identity and story seem to be shrouded in mystery, his contribution to Japanese skating remains one for the history books. Four years after Johnston's win, a young man named Nobuo Sato would go on to dominate Japanese figure skating for a decade, winning ten consecutive Japanese titles and competing at two Winter Olympics and six World Championships. He would finish as high as fourth in a field of twenty at the 1965 World Championships in Colorado Springs. 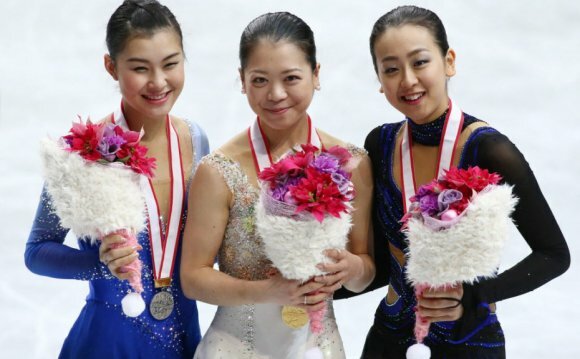 After retiring from competition, Sato married two time Japanese ladies champion Kumiko Okawa and the couple had a pretty talented daughter you might have heard of... I don't know... Yuka Sato? Ring a bell? Mr. Sato was inducted into the World Figure Skating Hall Of Fame and has coached a who's who of skaters including his daughter Yuka, Mao Asada, Miki Ando, Lucinda Ruh, Takahiko Kozuka, Fumie Suguri and Yukari Nakano. He's seen generations of skaters come and go including the reign of arguably Japan's most famous and well known skater Midori Ito. On Ito, Mr. Sato said in a 1989 edition of Asiaweek: "Ito was born with talent that can't be learned through training." A young Midori Ito landing ten double axels in a row! Whether through natural talent like Ito's or success achieved through arduous work on the ice like most skaters, Japan's skating community has continued to prosper under Sato's watchful eye and today Japan stands as one of the sport's superpowers with its first Olympic gold medals in history earned by Shizuka Arakawa and Yuzuru Hanyu within the past decade. The country continues to pump out talented athletes like nobody's business and you know what? That's really not bad for a country that certainly gave the rest of the world a thirty plus year head start when the competitive skating boom all began, now is it?